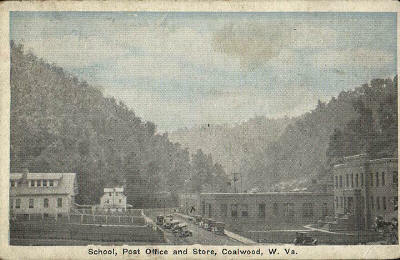 This is an old postcard of Coalwood Main. According to Alex P. Schust, "the postcard is before Consolidation took over. The large white building on the left was the General Manager's residence. The smaller white building next to it was the original club house." The Big Store is the building on the right side of the street that's closer to the road. The school is the taller building on the right side of the street. The school later moved to a new location further down the road (away from us in the picture, towards the tipple.) The building which houses the school in this picture later become the Community Center. At some time, the building was demolished, and the people of Coalwood lined the walls of the basement with concrete and created the Coalwood swimming pool which is still in use today! Based on the information we have so far, the table below represents significant dates in Coalwood's history. We are eternally grateful to Alex P. Schust and David Goad for helping us correct this list. 1857 George LaFayette Carter born in Hillsville, Carroll County, Virginia. 1902 Earliest recorded use of the name Coalwood. 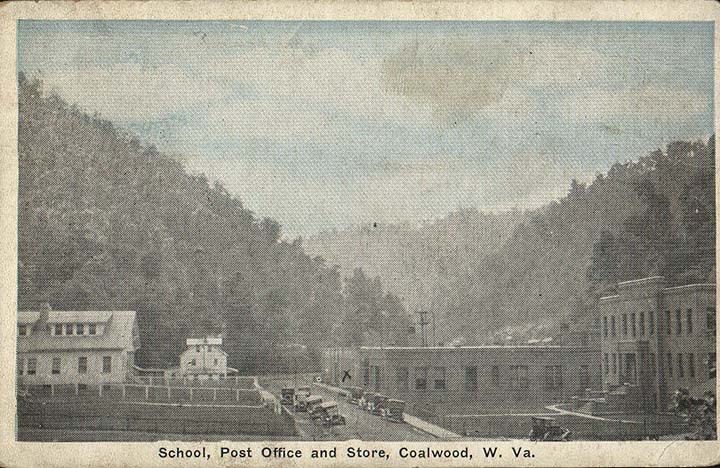 1905 Carter bought 20,000 acres in McDowell County, West Virginia, and began constructing a town at Coalwood. 1905 Carter builds a wooden tipple at Coalwood. 1914 First shaft mine goes into operation in Coalwood. 1922 Carter sold or leased properties to Consolidation Coal Company which was independent at the time. (Pittsburgh Consolidation did not become a company until 1945.) Carter had already built the brick store and office building. Consolidation built the new clubhouse. Source: Alex P. Schust. 1924 Mine shaft at Caretta installed. 1933 Consolidation Coal defaulted on its notes to Carter, and the property reverted back to Carter. Carter Coal Company resumes operations at Coalwood. Carter Coal Company regained possession of its coal properties on March 16, 1933. Source: Welch Daily News, March 15, 1933. When Carter Coal regained its property in 1933, James Carter was the President of the company and George L. Carter was the Vice President. Source: Alex P. Schust. 1933 Carter Coal Company mines are unionized. 1936 George Carter's son, James W. Carter, takes over as General Superintendent of Carter Coal Company. 1943 Homer Hickam, Jr. born on February 19. 1945 The miners refused to work because Carter wouldn't sign the standard union contract. The U.S. Navy is sent in for a period of six months to get the miners back to work. 1947 November 25, 1947. It was announced that a group of industrialists had bought Carter Coal Company. Industrialists were Youngstown Sheet & Tube Company, Interlake Iron Corporation, and Steel Company of Canada, LTD. Source: Source: Welch Daily News November 26, 1947. 1947 Olga Coal Company was incorporated on December 22, 1947. Source: Corporation Book 2, Page 471, McDowell County Court House. 1956 The mines at Coalwood and Caretta are joined underground. 1956 Olga Coal Company sold the houses to Clearfork Realty in 1956. Clearfork than sold them to residents. Source: Alex P. Schust. 1957 The Soviet Union successfully launched Sputnik into Earth orbit on October 4. 1959 Olga tears down Olga #1 tipple in Coalwood. Coal is now moved underground from the Coalwood mine to the Olga Caretta mine where it is brought to the surface. 1959 Norfolk & Western begins pulling up the railroad tracks from Coalwood to Clear Fork Junction. 1980 LTV Corporation buys Olga. 1986 LTV closes the mine at Coalwood. 1986 LTV sells the company houses in Coalwood to employees and others. 1991 LTV arranges for the Coalwood company records to be transferred to the Eastern Regional Coal Archives in Bluefield, West Virginia. "Big Creek Missile Agency" by Homer H. Hickam, Jr.
1998 Rocket Boys by Homer Hickam, Jr. published in hardback by Delatorre Press. 1999 Universal Pictures releases the movie October Sky in the United States. 1999 Rocket Boys is released as a mass-marker paperback by Dell using the new title October Sky. I thought you might be interested in some other details in the time-line posted in the Coalwood site. Lykes Brothers Shipping acquired Youngstown Sheet and Tube in the early 1970s and formed a division, Lykes Resources. Youngstown had three mines in operation: Coalwood area, Logan, WV and Nemacolin, PA. Plus, there were big coal reserves around Waynesburg, PA, which were opened as Emerald Mines(s). Chester Stone was the head of Lykes acquisition team and became president of Lykes Resources. Lykes hired a consulting company (Paul Weir and Associates) of Chicago to do the engineering and design work for the Emerald properties. I forgot Coalwood’s sups name (nice guy, though), but his son worked in the engineering department at Nemacolin Mine. I was hired by Lykes as a mining engineer (with WV Mine Foreman’s certification) by Lykes in the Spring of 1976 and was in all their mines at various times. Two names associated with the Coalwood/YST operation were Harry Swyhart and Floyd Alahochi (never saw their names written so the spelling is probably horrible). One had passed and the other left before I arrived. Robert Brennan was the head of YST coal operations (retained by Lykes as a consultant) and Floyd and Harry ran the coal mine operations and, I understand, they were very good at it. I left in January of 1979, when LTV officially assumed control (SEC approval in December of 1978). Place names in West Virginia. Listing of place names, year founded, and county located -- from the West Virginia Archives and History.